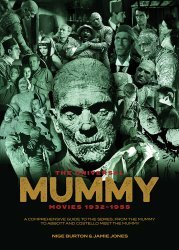 Direct to MyMovieMonsters.com from the creators of Classic Monsters of the Movies magazine in the United Kingdom: Universal Mummy Movies 1932-1955: We ship same or next day so don't wait for the UK! More pages than the standard guides, and it's perfect bound! Ancient, exotic, and unstoppable -- Universal's Mummy was brought terrifyingly to life by Boris Karloff in the 1932 horror classic directed by Karl Freund. The Mummy was their brand new monster after the success of Dracula and Frankenstein the previous year and would prove to be one of their most enduring. Although it was eight years before a sequel was produced, once The Mummy's Hand had been released in 1940, with Tom Tyler stepping into the bandages, it could only be a matter of time before the studio's franchise bandwagon pulled the character on board and handed the reins to its new master character creator, Lon Chaney Jr.
Our luxury franchise guide begins with a chapter devoted to The Mummy (1932) and covers each installment in the series in turn, with many rare stills, posters, behind the scenes information, facts and trivia. No ancient artifact is left unturned in exploring the whole Mummy series, including The Mummy's Hand (1940), The Mummy's Tomb (1942), The Mummy's Ghost (1944), The Mummy's Curse (1944) and Abbott and Costello Meet the Mummy (1955). 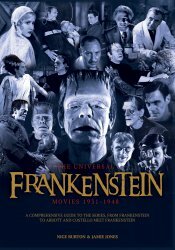 While supplies last we also offer issues of Classic Monsters of the Movies magazine, additional Ultimate Guides, and The Monsters Day-By-Day Almanac, The Scrap Book, and more.